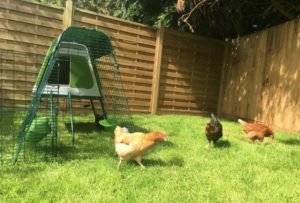 Whether you’re trying to convince your partner, housemate or parents to let you keep chickens, fear not, we have all the tricks of the trade to help get them on your side. 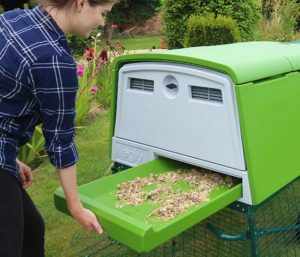 Most importantly you are going to want to house your chicken in an Eglu, therefore immediately some of their reservations about chickens will be eliminated by the unique and innovative design features. The Omlet guide for convincing anyone that you need to get chickens! 🐥 Answer: Chickens come in all sorts of shapes and sizes including bantams which would be happy even in the smallest garden. 🐥 Answer: Chickens smell lovely but their poo is a bit unpleasant. That’s why the Eglu is so easy to clean, in less than 5 minutes you can have it smelling like roses. 🐥 Answer: All Eglus are easy to move and chickens actually improve the grass by raking out moss and fertilizing it. 🐥 Answer: Eglus are predator proof, we’ve even had bears try and fail to get in. Foxes, badgers and birds of prey are all put off by the anti-tunnel skirt and tamper proof design. 🥚 We won’t be able to go on holiday! 🐥 Answer: Chickens live outdoors and you can leave them for a weekend with enough food and water. For longer periods your friends or neighbours will be happy to come and check on them, especially if they can help themselves to the fresh eggs. 🐓 Subtle hints – Start leaving cutouts from the Omlet brochure or pictures from our website around the house. Particularly successful spots include the fridge door, bathroom mirror and on top of their pillow. 🐓 Taste test – Get a farm fresh egg and also a store bought egg, do a taste test showing the difference in both colour and taste. 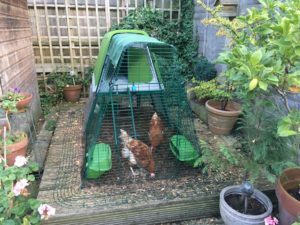 🐓Rescuing hens – Show them success stories from rescue hen charities and explain how you can save these birds and give them a happy home. 🐓 They eat bugs – Chickens are great little workers, so long as you keep moving them about your garden they’ll eat all the nasty bugs and ticks that you can’t seem to get rid of. 🐓 Friendly pets – People will be surprised to find out that chickens are actually very friendly pets, each with their own personalities. 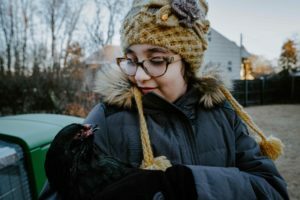 See if you can find a friend who already has chickens that you can introduce your loved one to so they can have the opportunity to ‘hug a hen’ and see for themselves how nice these animals are. Alternatively local farms and petting zoos will most probably have chickens you can go to see. 🐓 Start ‘hypothetically’ naming them – Start giving your soon-to-be chickens names. Try and get your loved ones involved in the brainstorm and then they’ll start to see how much fun you can have. Hen Solo, Princess Lay-a, Cluck Rogers… the list goes on!